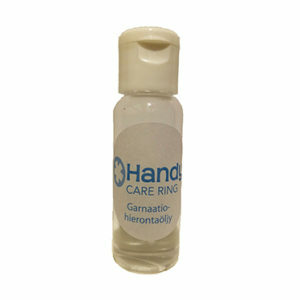 The Handy Care Ring™ is a new home-tool designed to treat tennis/golf elbow, mouse arm and other types of RSI. Using the Handy Care Ring™ releases tension in the muscles of your forearms, allowing the muscles to start recovering on their own. The positive effects can be noticed after only a brief period of time. This product was developed in Oulu, Finland and a patent has been granted. This product and treatment was designed by Eero Simuna, who has done a long career as a masseur. At first he designed this tool for himself to help with symptoms on his elbows and forearms. Entrepreneur Harri Ylitalo has also been in charge of product development e.g. choosing materials. According to Eero, most symptoms in the arms are caused by the muscle membrane of the elbows- and/or upper arms “sticking” together. This increases the amount of friction between muscles and causes irritation at the attachment points with pain in the membrane of the muscles. The positive effect of the care-ring is based on massaging cones, which are operated by placing your arm inside the ring. The cones can be adjusted to meet the needs of every individual user. Transverse movement of the ring releases the tension of both extending and contracting muscles of the fingers and the muscles that rotate the forearm i.e. extensor, flexor, pronator and supinator muscles. The treatment can be performed at home or under the guidance of a professional. Recovery starts fast and the effects can usually be felt after the first time using the product. Desired results can be reached in a few weeks, after using the ring regularly two to four times a week. 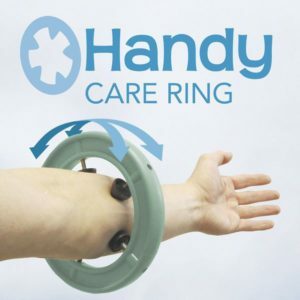 The Handy Care Ring™ has been under review by a test group of around 20 people, including people from multiple different professions. And the results have been encouraging.